Let’s start off by saying that with a name like Bloody, you can’t go wrong. The specs on the Bloody T70 live up to the name too. Take, for example, the world’s fastest response rate. 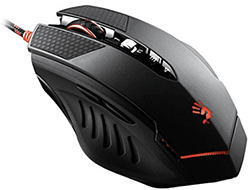 Or their infrared scroll wheel and a special underbelly design that makes it glide more smoothly than any other mouse in its medium-price range. 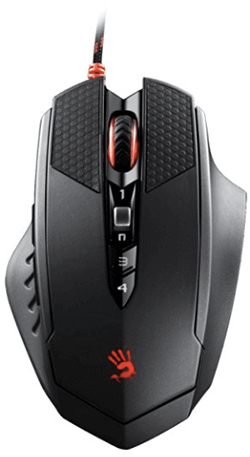 But before I get into what makes the Bloody T70 one of the best cheap gaming mice in the world, I want to take it back a few steps, starting with the software. For the T70, it comes with an all new software which is topped off with the Ultracore4 software activated and the company’s exclusive Ultra Core4 Bloody 5 gaming software. Within the software you can set up macro settings to perform multiple actions in gameplay. On the flip side, Bloody has assumed that every gamer out there will know how to install the software, meaning that you will have to figure this one out on your own. That’s not to say that company doesn’t provide instructions for the personalization software. You can find these on a card provided with the mouse. Whatever you do, keep your box. Once I had the software installed (which was an easy, easy set-up process), I wanted to see what the big deal was with the Light Strike Switch. I tested the mouse in a couple of games of CS and, boy, oh boy, did I find out why they call this the Light Strike Switch. Upon its activation, the mouse has a minimum 0.2MS tactical response speed, which is literally the fastest in the world. And the scroll wheel? Pardon me, the “infrared scroll wheel,” is absolutely wonderful. In addition to the fastest click response time (125 ~ 1,000 Hz/sec – 4-level adjustable), the Bloody T70 gives gamers the fastest wheel response rate (over 1 million scrolls). That smooth gliding capability? Yes, they’re calling it the X’Glide metal mouse feet technology and it’s totally deserving of its name too. The surface created extra durability and the glide is significantly improved over other gaming mice in its price range. The laser sensor is actually pretty smooth. Bloody is an all-around winner with great, marketable names for their technology. The Avago 9800 laser engine is a highly esteemed sensor in the gaming community. It even proved optical-sensor-lovers, like me, that a laser sensor can do the job right and, in some cases, even better than its optical counterparts. Throughout two games of CS, the sensor was smooth, precise, and effortless, making for an optimal FPS experience. I can’t forget to mention the 9 macro buttons or the 4 weapons mode of left key. Both of which make the personalization software a practical and effective dream tool. The 4-core system gives gamers an added level of customization. 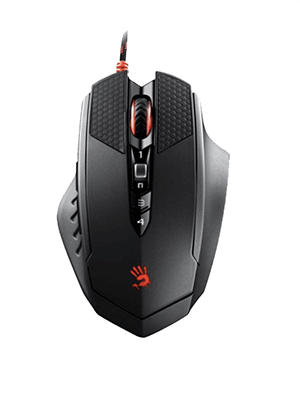 In terms of grip, the Bloody T70 is suitable for palm and claw types. The thumb rest makes it not so perfect for left-handed gamers but for myself, I found that it provides a solid amount of grip for medium-to-large size hands. The matte finish was a nice touch to an already close-to-perfect device. The right and left click buttons have a nice texture to increase grip and prevent slips from sweaty hands. A lightweight build also makes it easy for fast movements without feeling “cheap.” And if you’re one for colors, then it’s worth mentioning that the Bloody T70 gives you the option to choose from over 12 million colors for each part of the mouse. Overall, I’d say that I was impressed with the design of the mouse. It’s sleek, simple, and still very, very unique. What I love about the Bloody T70 is that you get what you pay for. Sure, we have to admit that Bloody utilizes some skillful marketing tactics and over-hyped names for click-bait purposes. However, I didn’t let this cloud my perspective of the mouse and as a result I was able to enjoy it for what it is without getting my hopes up. In other words, take the numerous “world-renown” titles with a grain of salt. Understand that no mouse is going to make us a Gaming God and that, if they do their job, then you’ve found yourself with a great mouse. And for the price, the Bloody T70 is just that with a little bit more to offer than its competition. Michael, from what I know the laser version of this mouse is the TL70. That’s the one wearing the Avago 9800 sensor. Bloody T70 is using an optical sensor. Correct me if I’m wrong.